Encore! Cast Choir and Orchestra will present their summer concert, “An American Revival – A Concert Celebrating the Voice of America!” on July 29, 30, 31 and August 4, 5 and 6 at 7:30 p.m. in Premier Theater at Disney’s Hollywood Studios. This year’s concert will feature classic pop, gospel and patriotic songs that celebrate the grand musical history of America. Proceeds will support the Dr. Phillips Center for the Performing Arts. Encore! Cast Choir and Orchestra was created in 2002 to give all Walt Disney World Cast Members and their families the opportunity to showcase their talents in a performing arts environment and give the proceeds from each concert to a charity. Over the past nine years, this unique cast club has performed ten different concerts featuring the music of Broadway, patriotic songs, gospel hymns, pop favorites, rock anthems and themes from the movies. The choir has grown from a 40-person choir and an 8-person orchestra to a choir of over 175, a 65-piece symphony orchestra and a 20-person dance troupe. Through their combined efforts, Encore! has contributed over $150,000 to deserving Central Florida charities. For ticket information and directions to our upcoming concert, please visit our website – www.encorecentral.org. By popular request, seating for this year’s production will be Reserved Seating. Our all-new Online Ticketing System will allow you to pick your own seats in one of three separately priced sections of the Premier Theater and print your tickets at home. Tickets are priced at $20, $25 or $30 each with no additional processing fees and we will happily accept Visa, MasterCard, Discover or American Express. To assist you in selecting your seats, a map of our new venue is provided on the right. Please go to the Encore website and click on the venue image thumbnail to get a full-sized view. In response to our Patrons’ feedback, all tickets for “An American Revival” will be E-Tickets, which will eliminate the need for any potentially confusing Will Call process at the theater. A Parking Pass will automatically print along with your E-Tickets, which will provide you with complimentary parking at Disney’s Hollywood Studios on show nights. E-Ticket grants you admission to our show venue no earlier than one hour prior to showtime. Separate Theme Park Admission is NOT required. Please refer to the Venue section of your Receipt for detailed Driving Directions, Parking Instructions and Venue Arrival Tips. Please be aware that online ticket sales will close two hours prior to showtime each evening. Although unsold tickets may be available at the door (Cash Sales Only), you are highly encouraged to purchase your tickets online due to our venue’s reserved seating configuration and limited seating capacity. In addition, we regret that we will be unable to provide Parking Refunds for those who arrive without an E-Ticket and Parking Pass. If you have any questions or concerns with ENCORE! Ticketing, please send an email to tickets@encorecentral.org or call our information line at 407-584-7640. 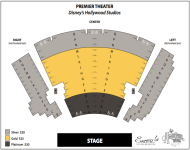 This entry was posted in Fundraisers, Performance space, Theme parks and tagged Concert, Disney's Hollywood Studios, Dr. Phillips Center for the Performing Arts, Encore! Cast and Choir, Walt Disney Company. Bookmark the permalink. Hope you meet your fundraising goals for the new center. Sounds like a fun event.